After former President Yanukovych’s U-turn on an Association Agreement with the EU last autumn, the new Ukrainian government is on course again to tighten its links with Europe, and the cabinet has submitted to the Verkhovna Rada [parliament] a package of bills to be passed before the first phase of an EU visa-free travel system can be implemented. The Ukrainian state faces numerous challenges today. After the pro-Russian era of Yanukovych, the government has a whole series of issues to deal with: no money in the treasury, economic knock-down, demoralised state apparatus, no stable majority in parliament, and most importantly – Russian troops massed across the border. In this difficult situation, a month ago the government headed by Arseniy Yatsenyuk announced a raft of objectives: urgent political reform of the country, successful presidential elections in late May, movement to visa-free travel for Ukrainians, the signing of an economic association agreement with the EU, and the maintenance of Ukraine’s territorial integrity (or at least, of its mainland). On 26 March, representatives of the European Commission and the European Parliament arrived in Kyiv to conduct a series of meetings and consultations with government officials, political elites and the public sector. During the meetings, EC Commissioner for Enlargement and European Neighbourhood Policy Štefan Füle and Yatsenyuk discussed a plan for implementing visa liberalisation for Ukraine. Svyatoslav Sheremet (on the right), a Ukrainian gay activist, was brutally beaten following a press conference in 2012. The EC announced that one previous requirement - legislation banning workplace discrimination based on sexual orientation - had been dropped. We are not aware of all the agreements made between the government and the European officials, but at a meeting with representatives of LGBT organisations, the EC announced that one previous requirement for transition to Phase II - legislation banning discrimination based on sexual orientation in the workplace - had been dropped. Instead, the government has promised a few concessions, including a recognition that the Ukrainian constitution prohibits discrimination on any grounds, including sexual orientation, and an increase in the powers of the Ombudsman. In pursuance of this plan, on 27 March the government submitted to Parliament Bill 4581 – ‘Draft Law on Amendments to Certain Legislative Acts of Ukraine (concerning prevention and combating discrimination)’, which amends existing law in terms of burden of proof and other technical issues, but does not include amendments to the Labour Code to prohibit discrimination based on sexual orientation. This bill was adopted in the first reading on April 15, 2014. Now it is being prepared for the second reading. The agreements have caused fierce disagreement among the public. The LGBT organisation Fulcrum has published an official statement, that: ‘human rights cannot be a matter of political bargaining. Discrimination based on sexual orientation and gender identity should be banned without any negotiations.’ This stance has been shared by the Coalition for Combating Discrimination (an association of civil and human rights organisations with more than 40 member organisations), which published a statement expressing similar views on its website. The softening of the European Commission’s position has significantly weakened human rights and LGBT organisations in their lobbying for anti-discrimination legislation. It is clear that in the run- up to the presidential election, the party of former PM Yulia Tymoshenko (which has a parliamentary majority) has already indicated it will not back a ban on discrimination in the workplace in case its rivals use this against them in the May presidential elections. Gay rights are far from a popular subject in Ukraine, so politicians see the issue only as a tool of political manipulation. In fact, both the government and the LGBT community have become hostages to the situation. There is nothing ambiguous about the banning of discrimination (according to LGBT organisations in particular); it is a simple matter of international human rights standards. But Ukrainian politicians have been manipulating LGBT issues for a long time: former Prime Minister Mykola Azarov, for instance, used to claim that the EU Association Agreement would require Ukraine to legalise gay marriage, which, of course, was completely untrue. And now a vote on this bill is highly unlikely in this parliament. 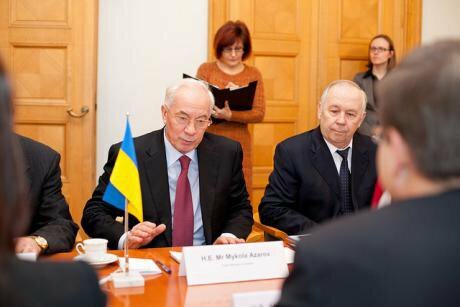 Former prime minister Azarov used to claim that the EU Association Agreement would require Ukraine to legalise gay marriage. This situation has a number of risks. First of all, if Bill 4581, which tinkers round the edges of the issue, is passed without specific reference to discrimination on grounds of sexual orientation, then a later vote on this alone is improbable, whereas if it were part of a package of measures it could be a reality. Secondly, the EC’s weak position enables the government to manipulate and avoid the implementation of the relevant provisions. Homophobes can now claim that the EU will happily accept Ukraine as it is, homophobia and all. The consequences of this policy are much deeper than they appear at first glance. Homophobes can now claim that the EU does not insist on the prohibition of discrimination against sexual minorities and will continue the process of admitting Ukraine into the EU as it is, homophobia and all. In this situation, the government looks like embarrassed parents who don’t know how to explain to their child where he or she has come from and resort to fairy tales about storks and gooseberry bushes. The adoption of this bill is necessary for only one reason – the government must state plainly to all Ukrainians that in the 21st century discrimination based on sexual orientation cannot be legal. We must realise that post-Maidan Ukraine is different. But instead of an open conversation, we got backroom games, with the European Commission willing to exchange gay rights for rapid progress on the visa-free travel front. The Ukrainian LGBT community now knows the price of human rights. The EU's position has consolidated Ukrainian public opinion, but everyone should be asking themselves the question: ‘how much are human rights worth?’ Ukrainians who have been hardened on the Maidan know – human rights are priceless, and they are non-negotiable. Perhaps the LGBT community needs its own Maidan - this time in Brussels?